Anyway, I actually took this picture yesterday while I was between classes. 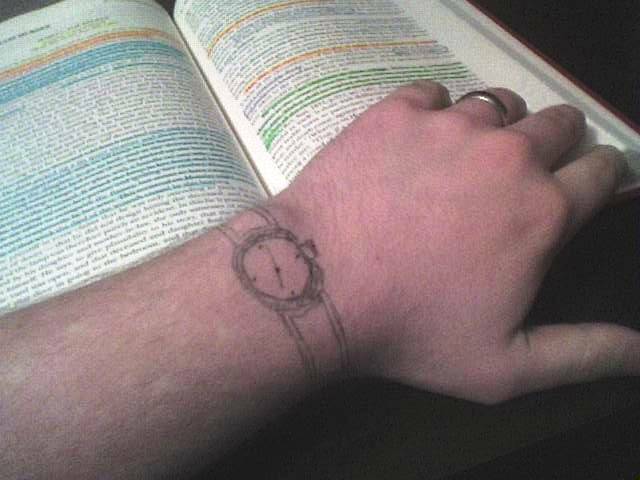 I wore a watch to school in preparation for a 10 minute oral argument I had to give (I normally hate wearing a watch) but it broke halfway through the day. Since next week is spring break for me, the passage of time seemed to be on my mind, and this little bit of body art sort of drew itself. Today, the ink has mostly washed off, but I can still see that the hands point to a few minutes after seven. Time always seems to move the slowest right before vacation, yeah? The argument went quite well, by the way. But more importantly, only one more class before break begins. To my new Thursday friends, have a good week! To everyone else, I can actually go out starting tomorrow, so hit me up. Oral argument? Law school? If so, me too. Nice watch hehe Does it keep time well? ;) Teasing. creative hnt pic! What time is it? Two hairs past a freckle... hee hee hee.... Dumb joke from 6th grade but it still makes me laugh decades later (damn I'm old). Happy HNT! Half past a freckle, a quarter to a mole.... Yeah I am 12! SO! neh. Look at all that highlighting, different colors and everything. You're serious about this school stuff, huh. Glad to see you have a sense of humor about time.